It's easy to get started developing Ruby on Rails apps that run on App Engine flexible environment. Because the apps you create run on the same infrastructure that powers all of Google's products, you can be confident that they can scale to serve all of your users, whether there are a few or millions of them. This tutorial assumes you are familiar with Rails web development. It walks you through deploying a new Rails app. This tutorial requires Ruby 2.3.3 or newer. Install Ruby version 2.3.3 or greater. Install the Rails 5 gem. Alternatively, you can use Cloud Shell, which comes with Ruby, Rails, and the Cloud SDK already installed. For additional information on installing Rails and its dependencies, see the official Getting started with Rails guide. After you complete the prerequisites, you can create and deploy a Rails app. The following sections guide you through configuring, running, and deploying an app. Scaffold a new Rails sample app. Go to the directory that contains the sample code. Install dependencies by using Bundler. In your browser, go to http://localhost:3000/. You see the "Yay! You’re on Rails!" message from the sample app displayed on the page. Note: In your terminal window, press Ctrl+C to exit the web server. Now add a Welcome page to the generated Rails app. To generate the scaffolding for a new page, create a new Rails controller named WelcomeController with an index action. Open the file app/views/welcome/index.html.erb to see the following boilerplate HTML. Set the index controller action as the root action for Rails. 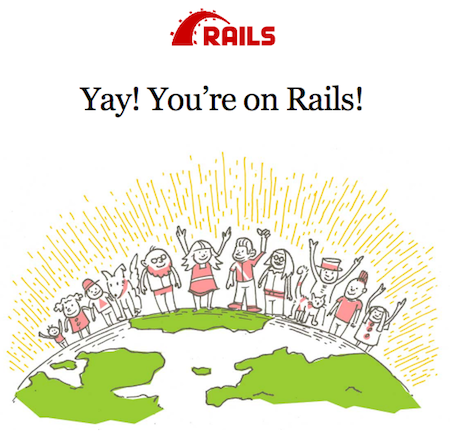 Then, whenever a user visits the Rails app, they see your welcome page. Open the file config/routes.rb to see the following generated content. To modify this file, add root 'welcome#index'. Save the file and close it. Test the Rails app as you did before. App Engine flexible environment uses a file called app.yaml. to describe an app's deployment configuration. If this file isn't present, the gcloud command line tool tries to guess the deployment configuration. However, it is a good idea to provide this file because Rails requires a secret key in a production environment. When you deploy a Rails app in the production environment, set the environment variable SECRET_KEY_BASE to a secret key that is used to protect user session data. This environment variable is read in the config/secrets.yml file. Generate a new secret key. Copy the generated secret key. You use the secret key in the next step. Open the file app.yaml that you created earlier, and add an env_variables section. The env_variables sets environment variables in the production environment in App Engine flexible environment. Your app.yaml should look like the example below, with [SECRET_KEY] replaced with your copied secret key. If this is the first time you are deploying an app, you need to create an App Engine flexible environment app to help you select the region in which to run the Rails app. You can read more about regions and zones. Create an App Engine app. Select a region that supports App Engine flexible environment for Ruby apps. Before you deploy, precompile your Rails assets. After the assets finish compiling, deploy the sample. Wait for the message that notifies you that the update has completed. This can take several minutes. To retrieve your project ID, run gcloud info. In your browser, go to https://[PROJECT_ID].appspot.com. [PROJECT_ID] is the project ID you retrieved in the first step. The following content is displayed. This time, your request is served by the Rails app running in App Engine flexible environment. This command deploys the app as described in app.yaml and sets the newly deployed version as the default version, causing it to serve all new traffic. As the app deploys, you might see several repeated messages while the platform checks whether the app is serving. This is normal. Wait for the message that notifies you that the update of the app is complete. Now that you have deployed your Rails app, you may want to read the logs. You can read the app logs by using the Logs Viewer located in the GCP Console, or by using gcloud app logs read. You can learn more about reading logs by using the Cloud SDK. After you've finished the Running Rails 5 in the App Engine tutorial, you can clean up the resources you created on Google Cloud Platform so they won't take up quota and you won't be billed for them in the future. The following sections describe how to delete or turn off these resources. Learn how to use Cloud SQL for MySQL with Rails. Learn how to use Cloud SQL for PostgreSQL with Rails. Learn how to run the Ruby Bookshelf sample in App Engine flexible environment. Learn how to run the Ruby Bookshelf sample on Compute Engine. Learn how to run the Ruby Bookshelf sample on GKE.